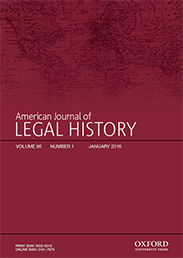 The American Journal of Legal History was founded in 1957 and was the first English-language periodical in the field. The new AJLH aims to publish outstanding scholarship on all facets and periods of legal history. While retaining its focus on American legal history, it accommodates the enormous broadening of the intellectual horizon of the discipline over the past decade and is particularly interested in contributions of a comparative, international or transnational nature. Book reviews are a regular feature. The field of “legal history” studies the relationship that “law” and legal institutions have to the society that surrounds them. “Law” means everything from local regulations and rules promulgated by administrative agencies, to statutes and court decisions. Legal history is interested in how “law” and legal institutions operate and how they change over time in reaction to changing economic, social, and political conditions. It looks at people who are “governed” by law, as well as how those people try to influence law and legal actors. Thus, the field covers such diverse topics as the Roman law of wills, the social and economic conditions that brought down feudalism, the legal ideas motivating the American Revolution, the way that slave patrols kept the slave system in place, the legal regulation of business in the early 20th century, right up through the Black Power movement’s critique of the US criminal justice system. The field has many subjects of study and many focal points, drawing on (and engaging with) studies of economics, religion, society, and culture. For a deeper understanding on the history of law, we asked Professor Alfred L. Brophy, one of the Editors of the American Journal of Legal History, to give us some insight into the past, present, and future of law’s relationship to culture over time. My first interest in legal history that I can remember came when I read Jerold Auerbach’s Unequal Justice in a class on modern American history. It’s a really exciting study of lawyers from the Progressive era to about World War II. It looks to the bar’s attempts to keep out Jews and others and how that had important effects on how justice was administered. And then things went from there. A lot of my interest in college was in quantitative methods of studying history; it was in law school that I really learned to love intellectual history. How has it changed in the last 25 years? The field has changed so dramatically over the past 25 years (basically the time since I graduated from law school), it’s hard to get a good grip on this. For instance, in 1990, legal history was largely about legal doctrine, often focused on judges and great writers. Now we are much more focused on the litigants and “objects” of law – people whose lives are led under the threat of prosecution, for instance. And we are paying so much attention to how those outsiders challenged and remade law. We are getting a lesson on this now in the United States with the “Black Lives Matter” movement. What was your first published paper in the field of legal history about? The first article I published after I started teaching was in AJLH—it was a quantitative assessment of litigation in a county in late 17th century. And it unfolded into some other cool work on the first law book written in British North America. Even before that article, when I was in graduate school, I submitted an article on southern constitutional arguments about the suppression of abolitionist literature. AJLH didn’t take that one. So AJLH gave me one of my first rejections, as well as one of my first publications! Given my personal experience with the journal – now about two decades ago – one of the things that I hope we will do a lot is promoting newer scholars. What is your vision for the American Journal of Legal History? I have incredibly high hopes and expectations for the AJLH under OUP’s leadership. I hope we’ll build on the legacy of the journal and that we’ll push the boundaries of legal history. I want us to publish work that cuts across nations and legal systems, that employs methodologies from the social sciences, that studies the role of all participants in the legal system, that links law to culture, that delves deeply into doctrine. I hope we’ll connect to contemporary movements that are asking about how legal reform happens. I hope we’ll be an important outlet for studies of the role of gender and race in the legal system. I hope we’ll do it all. What role did legal history play in some of the recent high profile Supreme Court rulings? Legal decisions are deeply connected to the past – often it’s the fairly recent past. But sometimes, especially in US Supreme Court decisions, judges take a longer view of history and how it informs the present. One place we saw this recently was Chief Justice Roberts’ opinion in the Affordable Care Act. He cited a number of opinions of Chief Justice John Marshall, to frame the rights of the federal government over issues of commerce. Decisions about the Second amendment, which deals with gun regulation, frequently turn to questions about what was permitted in the eighteenth century to gauge the amendment’s scope now. What have you found particularly surprising in the field as it has evolved? I think the thing that is most noticeable to me is how much legal historians have expanded the subjects of study. We now ask, for instance, what enslaved people thought about law and how they mobilized to change law. When I was in law school, the field was much more focused on what the “great” judge said. Now we care more, it seems, about what the almost anonymous person thought about law and how she took action on those ideas. The quality of the work is outstanding now. I’m always astonished at how sophisticated work is now. Part of this is the result of the growth of the field – but I think part is also due to the explosion of electronic databases, which make data much more easily available and have heightened the importance of interpretation. Why is legal history relevant? Legal history tells us about central questions of how we organize our society; it’s a terrific guide to all sorts of questions of morality and duty. It helps us understand and shape our government. I am always astonished at how often we hear arguments about history – particularly legal history – thrown around in public debate. And we need people to develop that knowledge and to guard against misuse of data. If you had a time machine and could transport yourself to one point in the last 100 years which has made a huge impact on legal history, where would you go, and why? It’s hard to pick only one moment – there are so many I’d like to see. It’s hard to beat the argument and decision of Brown v. Board of Education but maybe that’s too clichéd an answer. Karl Lewellyn is a real hero of mine and I’d like to meet him. Legal realism looms so large over basically everything we do in law in the United States. For personal and professional reasons, because the Selma to Montgomery march is so important in the US journey towards civil rights, I’d love to be there on a certain Sunday in March 1965. Those brave souls crossed the Edmund Pettus Bridge to an uncertain future. And then, a few weeks later, they crossed the bridge again and went all the way to Montgomery, and the voting rights act of 1965 shortly thereafter. Pick one or two salient points in the history of legal history that have changed the world as we know it. There are some huge turning points in US history, for sure – I think of the Declaration of Independence, the Constitution, the Reconstruction era amendments to the Constitution, and the constellation of civil rights decisions and legislation that ran from just before Brown to the Fair Housing Act of 1968. Does it sound too jingoistic to say that the Declaration set us on the road to equality and we’ve been working out the promises of the Declaration ever since? A lot of recent writing on legal history focuses on the places where the United States has fallen short – far short – of that promise. But a lot of writing is about how we have moved towards that promise, too. If a student was unsure about studying legal history, how would you convince them? Students – particularly law students – should study legal history because so much of contemporary law relies on arguments from history. You learn a lot about what arguments are effective. Legal history, like law and economics, is a method that’s useful to lawyers and it’s a critical part of the profession. Studying legal history, we see how lawyers today are part of a very long tradition and it inspires us to carry on and improve on that tradition. Even those who are not going to be lawyers will benefit from studying legal history because arguments about the Constitution come up constantly in contemporary politics. As I’m writing this we are hearing about Donald Trump’s proposals about immigration; we have seen these issues before and legal historians have a lot to say that is relevant to Mr. Trump. Probably by the time you’re reading this, everyone will be talking about another constitutional controversy that is informed by legal history. Featured image credit: The Obamas and the Bushes continue across the bridge. Official White House Photo by Lawrence Jackson. Public Domain via Wikimedia Commons. Alfred L. Brophy is the Judge John J. Parker Distinguished Professor of Law at the University of North Carolina School of Law in Chapel Hill, North Carolina. He, along with Stefan Vogenauer, the Director of the Max Planck Institute for European Legal History in Frankfurt, are Editors of the American Journal of Legal History.